Waiouru: Both sides of the coin! Some years ago when employed in a middle management position I used to get slightly annoyed by employees who used to complain about their perceived lack of freedom. I would patiently tell them that freedom is like a coin…….. you can have a much as you want to take! But on the opposite face of the coin was ‘responsibility’. You can’t have one without the other! Of course they wanted one but not the other. I’d also explain ‘freedom’ was your ability to take you car for a drive whenever you liked. Responsibility was driving it on the correct side of the road! 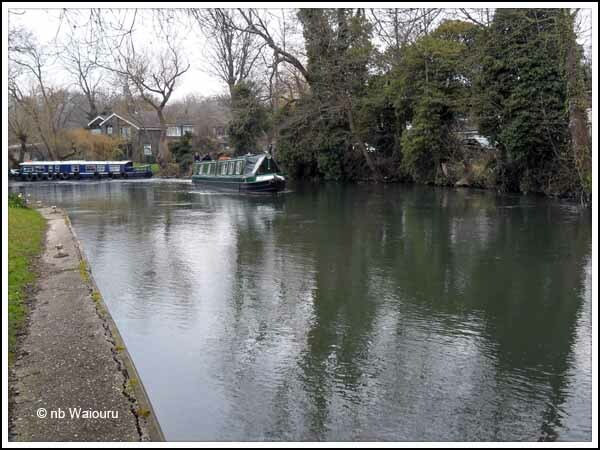 When we arrived at the 48 hour moorings above Woolhampton lock there were two wide beam boats already occupying two of the five designated moorings that have a firm edge (concrete and wood capping) and anchor rings. During my frequent walks along this stretch of the towpath I’ve noticed they have been here for some time. During winter these ‘good’ moorings were designated as “C&RT Winter Moorings’ and payment was required to use them. 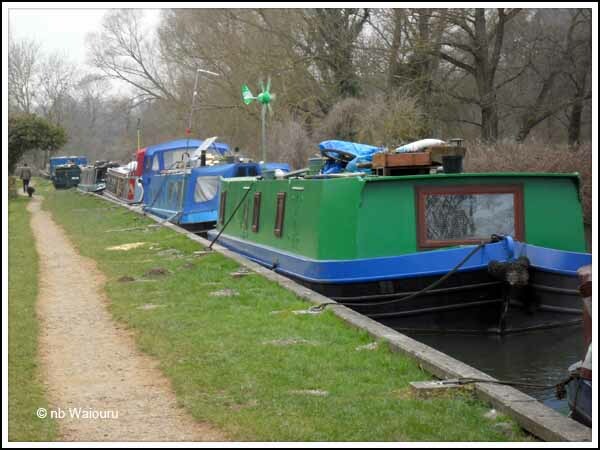 I noted during this time the wide beam boats were moored further back down the canal off the 48 hour visitor moorings. Yesterday we had lunch at The Angel. I asked the new publican if he intended to place any advertising down by the canal and was informed one of the boaters had offered to place a sandwich board on the roof of his boat. Walking back to Waiouru after lunch I noticed the boater lives on one of the wide beams sitting on the 48 hour visitor moorings. If the boater is prepared to place advertising on his boat for a local business whilst sitting on a 48 hour visitor mooring it tends to give the impression they are developing some permanency about the location. An example of someone who wants a large quantity of freedom but ignore their responsibilities. No doubt they will eventually get moved on and ordinarily I wouldn’t write about the matter. But last night they also ran their engine until well after 11.00pm. I enjoy my freedom to cruise when and where I like. But I also accept the increased freedom places greater responsibility on me to comply with my boating obligations. At times it does rankle when others don’t comply with their responsibilities! I don’t imagine the UKBA will find them! nb Whistler (Graham & Jan) went past in the morning heading towards Thatcham. Graham called out it was only a day trip before they start heading for the Thames and Oxford. Moored in front of us last night was nb Maris Piper (Ian & Sue) with their grandson (Lewis) aboard. 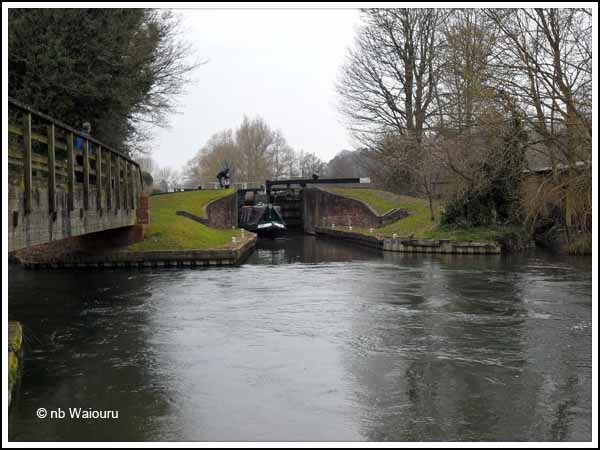 Sue is recovering from an operation so we volunteered to assist them through the Woolhampton lock and swing bridge on their way back downstream to Froud’s Bridge Marina. Ian said he and Lewis could manage the lock but accepted the offer from Jan to open and close the bridge. I wanted to watch how he managed the transit from the lock through the bridge as it’s something we must do on our return journey. Maris Piper waits at the lock whilst Jan opens the bridge. Note the strong current from the river entering at the left of the photo. The current from the river pushes Maris Piper over to the far side and Ian now needs to work his way back across to align the boat with the bridge hole. The speed of the current was already moving Maris Piper but Ian also needed to apply more throttle to retain some steerage. It’s going to be an interesting transit when Waiouru goes back down. Oh…. and Maris Piper is named after Maris Piper potatoes! Ian and Sue had a potato distribution business before retiring. After lunch we slipped our mooring ropes and were about to depart before realising we’d forgotten to fit the tiller arm! Then we noticed two boats coming towards us and C&RT working boat Nelson had once again pulled out a mooring pin and was adrift across the canal. It was Bill and his wife on nb Sea Vixen working their way around Nelson on their way back to Froud’s Bridge. I called out a quick hello as I walked up to Nelson with a club hammer to re-secure the boat. The mooring pin was quite short and flimsy for such a large boat! 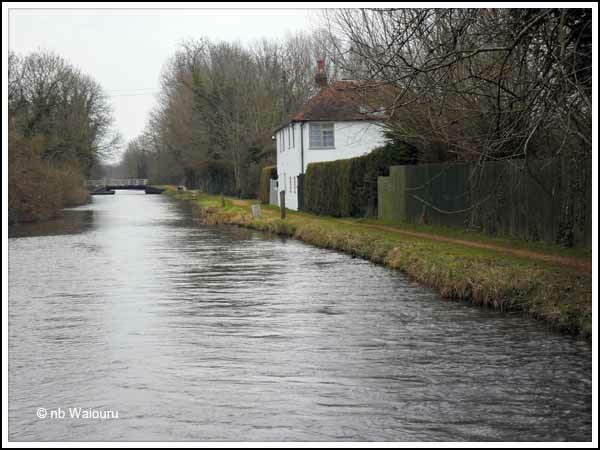 We then headed towards Thatcham with Jan working the locks and swing bridges whilst I steered. There was a small drama at the second swing bridge when Jan was unable to open it. We resolved this just as Whistler appeared from the opposite direction having winded (turned). We waved them on through before Jan closed the bridge after Waiouru. There’s an interesting lock-side cottage just west of the bridge. Signs on the cottage state it no longer has any association with the canal and large dogs are running loose! At Heale’s Lock we met a boat that was just exiting and heading towards us. The steerer called a warning that there was a large amount of long grass floating in the lock. 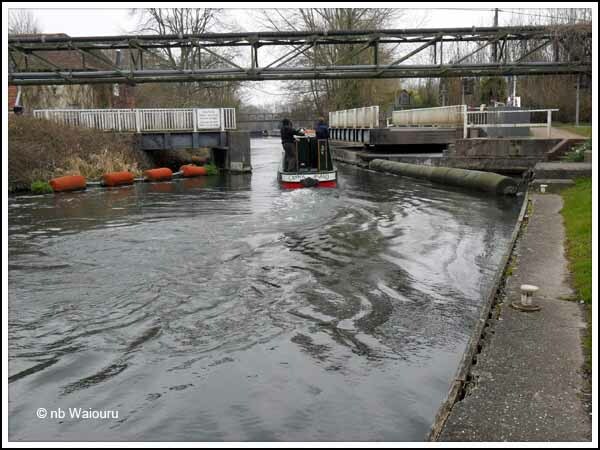 The lock appeared to be a very slow filler until I realised the previous boaters had not closed one of the paddles at the downstream end. Water was running straight through the lock! They also failed to take their windlass with them. Our luck may have changed! We’re still experimenting with out locking technique. 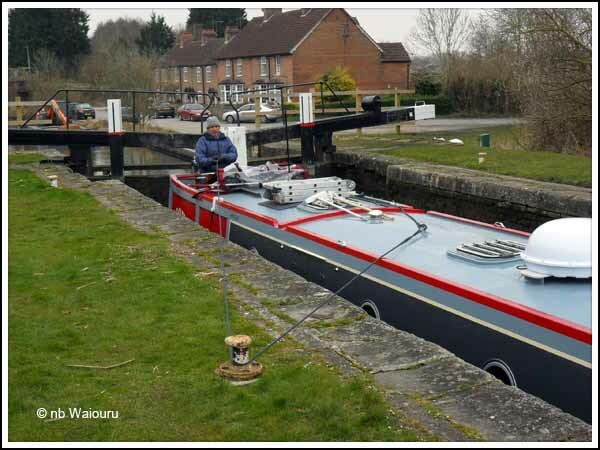 In an effort to keep Waiouru against one side of the lock we have been using the centreline around a bollard. Sometimes it works……. And sometimes it doesn’t! 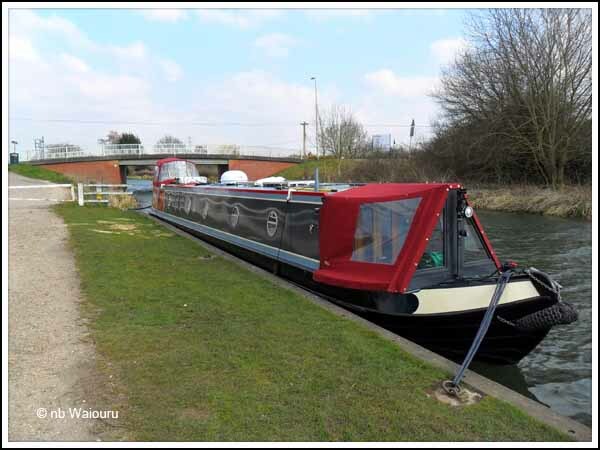 It was pleasing to arrive at Thatcham and find plenty of room on the 48 hour moorings. What wasn’t so pleasing was our attempts to secure Waiouru in the wind. At one stage the wind caught the bow and started to drag Jan in for a swim. In the end we reversed off and made a second (successful) attempt. It’s somewhat windy here and we’re also close to the railway station so it’s likely to be a noisy night (or two). Of course the sun came out just after we completed mooring. Tomorrow the plan is to purchase red diesel from Pinnocks at Thatcham which we will use to fill the Hurricane and Refleks tanks. The ‘domestic’ price of diesel at Froud’s Bridge Marina is currently £1.15/ltr whilst at Aldermaston Wharf it’s £1.07/ltr. Pinnocks are selling red diesel at 89p/ltr. As both stove tanks are almost empty we should save some money pay less for the diesel. This presumes I will be able to successfully carry the diesel the 600 metres between Pinnocks and the boat using the folding sack trolley. I trust you have emailed CRT the info about the engine running late etc. Their staff can't be everywhere at all times of the day to personally observe the problem. If they don’t know about the problem they won’t allocate any resources to fix it. The more reports they receive the more action they can take. If one boater reports another boater running a generator late it comes down to one boater’s word against another’s – and some reports are deliberately false so they have difficulty acting on one report. With two (or more) reports then they can, and will, act. If they don’t receive reliable reports its unfair to complain they aren’t acting. I can accept the late running engine because we were sleeping at the other end of our boat and it would be rather easy for the boater to claim they had either forgotten or had fallen asleep. However I don't accept the overstaying on the 48 hour moorings and if they are still there on our return trip I'll report it to C&RT.